“What is your purpose?” This is the key question that the Griffith Sciences’ learning and teaching team asks academics to continually reflect upon throughout the design and development of learning and teaching activities. The response to this question offers guidance for refining and rationalising the resources, tasks and sequences required to efficiently and effectively develop blended learning tasks. 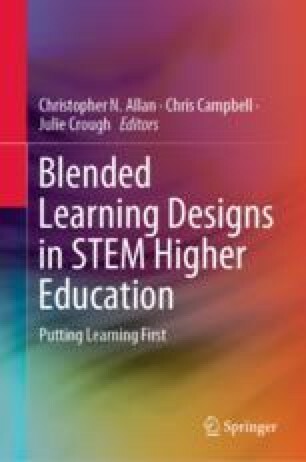 This chapter showcases a process undertaken within the Griffith Sciences Blended Learning Model to support blended learning design. The process included the creation of a range of visual learning designs developed through the use of a series of professional learning questions to focus on the purpose for student learning with the chapter including examples of the visual learning designs and the types of professional learning questions used. Each of the resulting learning designs provides a simple visual dataflow that outlines the sequence of teaching and learning activities while identifying the appropriate resources and personnel required to efficiently and effectively complete the appropriate tasks. Two case studies are included to elaborate on the process undertaken and demonstrate its operation. In writing this chapter, we would like to acknowledge the contributions of the academic teaching staff who participated in the Griffith Sciences Blended Learning Model project. They demonstrated the engagement, motivation and commitment necessary to enhance the student experience in their specific courses. We thank them for their readiness to offer and consider ideas and advice in addition to generously providing us with the benefit of their extensive disciplinary knowledge. In particular, we’d like to acknowledge the contributions of Dr. Belinda Schwerin and Mr. Arie Korf for kindly permitting us to include the development of their assessment activities as case studies within this chapter. They exemplified what can be achieved when purposefully designing and implementing authentic student experiences within a learning environment. Agostinho, S. (2011). The use of a visual learning design representation to support the design process of teaching in higher education. Australasian Journal of Educational Technology, 27(6), 961–978. https://doi.org/10.14742/ajet.923. Allan, C. N., & Green, D. M. (2018). Griffith Sciences Blended Learning Model. Retrieved November 7, 2018, from https://app.secure.griffith.edu.au/exlnt/entry/6405/view. Britain, S. (2004). A review of learning design: Concept, specifications and tools. Retrieved November 7, 2018, from https://staff.blog.ui.ac.id/harrybs/files/2008/10/learningdesigntoolsfinalreport.pdf. Campbell, C., & Korf, A. (2018). Supporting student learning through innovative technology in the aviation classroom. In ICICTE Proceedings 2018 (pp. 18–28), Corfu, Greece. Retrieved November 7, 2018, from http://www.icicte.org/assets/1.3_campbell_korf.pdf. Goodyear, P. (2005). Educational design and networked learning: Patterns, pattern languages and design practice. Australasian Journal of Educational Technology, 21(1), 82–101. https://doi.org/10.14742/ajet.1344. McGee, P., & Reis, A. (2012). Blended course design: A synthesis of best practices. Journal of Asynchronous Learning Networks, 16(4), 7–22. https://doi.org/10.24059/olj.v16i4.239. Puentedura, R. R. (2012). The SAMR model: Background and exemplars. Retrieved November 7, 2018, from http://www.hippasus.com/rrpweblog/archives/000073.html. Wilson, G. F. (2002). An analysis of mental workload in pilots during flight using multiple psychophysiological measures. The International Journal of Aviation Psychology, 12(1), 3–18. doi:/ https://doi.org/10.1207/s15327108ijap1201_2.